Last week I started my six month internship at an academic publishing house in The Hague, and so far so good. 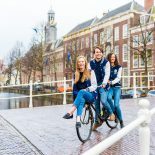 However, as an international student in Holland, internships are not entirely straight forward.For those who need soem help and advice, here’s my two cents worth. All three worked. However, I think the random CV sending was a pretty lucky shot so don’t be surprised if that doesn’t work. The route most likely to work would be through using contacts. My contact was my tutor as I explained to him what I was hoping to do once I graduate so he helped me by finding a friend of a friend who got me an interview. This is really how it works in Holland, but to be fair, it’s probably the same for everywhere now. Anyway, so after a probably informal interview, you now you have an internship. Hopefully at least. You will receive a contract from your employer with the details which you will sign and return to them keeping a copy for yourself. This will detail working hours, pay and any other details necessary. In Holland (again, probably everywhere), it is not mandatory to pay interns so although it is sometimes done, you probably shouldn’t expect it. A complication is that if you are paid and are registered by the company with the tax office you may get taxed. I have not received my pay yet so am waiting to see if I lose a big chunk of my remuneration as taxes here are 43%. You will have to have health insurance, for which basic rates are around 120 Euros per month. The government simply signed me up with a health insurance company when they were informed by the publisher that I would be working for them. I have no idea how to find your own. However, you can then apply for the zorgtoeslag after applying for a DIGID (digid.nl) and you will receive some money towards the insurance costs because if you are looking for an internship you are probably a penniless type. However, if you do your internship whilst still studying you don’t need the health insurance and you don’t get your remuneration taxed. Problematically it seems that many internships are full time so studying at the same time would appear impossible to me. It is important to note that many companies in Holland reimburse travel expenses, so ask about that as soon as possible so you don’t miss out on any money you are entitled to claim and always buy tickets as proof, don’t top up your OV chipkart. There are lots of opportunities in The Netherlands, though they may take some time and effort to find. Good luck! This entry was posted on April 11, 2013 by admin@theleidener in Anna.